Lyrical dance is offered only at a competitive level at our studio and is by recommendation only. 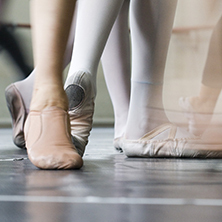 Students must achieve a certain level in jazz and/or ballet class in order to participate in the class and/or be recommended by the studio instructors specifically. Lyrical is a combination of ballet and jazz technique threaded together to interpretative music to create a picture and/or story on stage or in the classroom. Black, grey or red dance attire with no pattern or label and Black dance shorts of choice. No tank tops may be worn over bodysuits to class. Hair must be fastened in a tight ponytail with no bangs. Students will not be permitted into lyrical class without proper hair and dance attire. Students may wear Jazz shoes to Lyrical class until a competition choice is made for the season.